The Lea gauge is a vertically mounted chart recording gauge which measures the sea level by means of a float in a stilling well. The float is connected to the large drum in the lower centre of the picture and the counter weight connected to the smaller drum on its right. This difference in drum size means the counter weight does not enter the seawater on every tide. The disadvantage is that the counter weight has to be proportionally heavier to counter balance the float. The pen arm is moved up and down the chart by means of a chain loop linked to a worm gear on the drum axle. 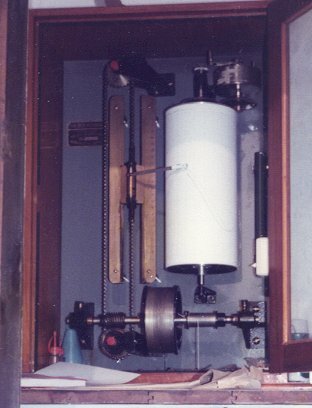 This particular picture of a Lea gauge was taken in 1983 when it was in operation at the Portpatrick.